How do you test a setting? Testing, in its many forms, is a key component to many activities. Testing is now de rigueur in mechanical processes, and has gained traction in the creative world over the past century or so, thanks to the proliferation of writer’s circles and proofreaders. Last week saw a test, as part of the confluence of two neat things: a game of the RPG Warrior, Rogue & Mage, and an RPG setting that we’ve been building here at the Gamer Assembly. This was the first public test of the setting, though it was mostly a backdrop. I described the overall history of the world at an extremely high level in a few sentences, explaining how that history has shaped modern society. I then described the empire in which the game would be played, and we launched the adventure. That was all I needed. For a setting that still being built, I mainly want to know one thing: can it be quickly and easily explained? So far, so good. Here’s a cleaned-up version of the introduction. Does this make sense to you? Far back in history, in the beginning, there were the Old Ones. They ruled over the world, creating all the humanoid races. After many years of toil, the humanoids allied with the dragons and killed the Old Ones. The dragons taught the humanoids magic, and all went well until two crises appeared. The first was the Dragon Plague. Many humanoids and dragons died before a multi-racial party of adventurers found a cure. Meanwhile, many dragons left this plane of existence, some returning much later. Those who remained sequestered themselves into their own burrows and caves, and they were somehow changed. The dragons of old were brilliant thinkers and social; today’s dragons are barely more than beasts. The second crisis began with the Ascendancy of Ana-Lesh, an elven mage who learned the secret of godhood and became a god herself. Soon, others followed, until the paths to godhood were closed. Today, this history has created an intensely multi-cultural world. There are no racial empires; instead, three empires now rule the land. This game is set in the Empire of Illusion, a magical oligarchy ruled by a cabal of extremely powerful wizards. They maintain a secret police, the Wolves of Shadow, who deal with any large-scale problems. Otherwise, the populace is left on its own, so petty crime is rampant. However, there’s a large middle ground of dangers that may one day threaten the empire, but are too small for the Wolves to bother themselves with. For these, the Wolves have built a network of adventurers. Individuals will be summoned into teams, who are sent out on missions for the Wolves, who at least pay handsomely. SFX: Ridiculous Explanation. Use multiple specialties in your dice pool when inflicting mental stress then add your effect die to the Doom Pool. Limit: Complicated Plot: Earn 1 PP and add 2d12 to the Doom Pool when your actions make the plot too complicated to follow. Studio Ghibli and its most famous director, Hayao Miyazaki, are known for their remarkable animated films. Their stories emphasize pacifism, intelligence, kindness, and respect for the natural world. While several of their movies could be labeled “action movies,” their protagonists (mostly girls) are usually not warriors, and they wrestle with complicated, multi-faceted problems rather than simple good vs. evil fights. There is rarely any combat in a Studio Ghibli movie. What would a role-playing game like this look like? The system should encourage group collaboration and consensus. The system should resolve conflict at a high level, rather than using blow-by-blow dice mechanics. Conflict resolution should be less about success and failure and more about many outcomes. The system should have minimal combat abilities. Let’s look at existing systems that are close to what I’m looking for. The first that comes to mind is FATE. Thanks to the Fudge Ladder, Aspects, and Skills, characters can be described using personality traits and beliefs than as physical abilities. So, let’s define characters by giving them a bunch of aspects. How do we keep track of them? One convenient method is cards, so we’ll assume that each character is defined by a set of 10 personality traits, each written on a card. Some cards will be more useful in some circumstances than others, and we want a mechanical way of representing that. For now, we’ll put keywords on the bottom of each card, indicating the kind of situation that the card is particularly suited for. How do we handle conflict? Let’s take a few pages from the recent Marvel RPG, by establishing scenes and conflicts, and letting players build dice pools. But instead of facing off against just opponents, let’s also add possible outcomes to the mix. So, each conflict is made up of a mixture of Dangers and Futures. Players bid their cards on a particular Future, which adds dice to a dice pool on that Future. 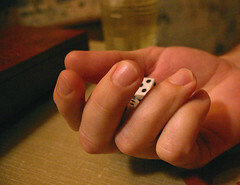 When all players have bid, the dice pools are rolled. Dangers must be neutralized by assigning dice to them. How to prevent players from just throwing low-rolling dice on the Dangers? We’ll give each Danger a value, so you must sacrifice a die that rolled at least as high as the Danger’s value to neutralize it. That’s a first stab. What do you think?